The Champaign County Regional Planning Commission serves as a data resource for Champaign County and Champaign County municipalities. In addition to acting as the local Census data clearinghouse, CCRPC maintains a Regional Dashboard that provides demographic, economic, and other data from a variety of sources for Champaign County and its municipalities. 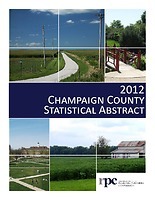 This resource takes the place of the Champaign County Statistical Abstract and is updated frequently to ensure that all data is current and accurate. CCRPC has also developed a set of community indicators based on the 2007 Our Future. Here. community visioning project. Thirty-two indicators divided into eight categories (Accessibility, Economics & Poverty, Education, Engagement, Health, Mobility, Safety, and Sustainability) provide insight and analysis into the county and its communities. CCRPC staff planners also respond to data requests from the general public, other RPC divisions, member agencies, and other organizations in Champaign County and East-Central Illinois. Data requests can cover a wide range of topics, but usually involve CCRPC staff retrieving, compiling, or interpreting data from a variety of sources for the client. Data requests can be very simple (e.g., providing the unemployment rate in Champaign County for a given year) or very complex (e.g., creating a site or area analysis, including tables, maps, and interpretation). Requests are filled within the confines of Illinois state law. To submit a data request, contact staff planner Kathleen Oldrey.